The BExS120 alarm Explosion Proof Sounders are suitable for Zone 1, 2, 21 & 22 applications. Approved to IECEx, ATEX, Ex EAC and INMETRO standards. Sound level ouputs are up to 123dB(A) at 1 metre with a choice of 32 alarm tones and 3 remotely selectable stages. The BEx range features enclosures manufactured from corrosion proof, marine grade copper free LM6 aluminium with chromate and powder coat finish. 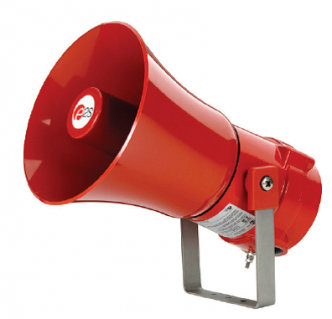 For fire applications the BExS120D 24V dc siren is CPD EN89/106/EEC compliant (EN54-3 tested). – Electronic sounder up to 121dB. – 32 tones, including ISO tones to Australian Standards. – Automatic synchronisation on multi-sounder systems (requires sounders to be connected to the same supply). – Sound Output: Max: 121dB (A) @ 1m, Nominal: 117-108dB with volume control. – Sound Frequency: 32 tones (see tones table in attached pdf). – Temp Rating (degrees Celsius): T4 -50 to +55. – Construction: LM6 aluminium housing, stainless steel guard and mounting bracket, ABS flare. – Approval: II 2G Ex d IIC T4 (max ambient temperature +55 degrees Celsius), II 2G Ex d IIB T4 (max ambient temperature +70 degrees Celsius), II 2D Ex tD A21 IP67 T115 (DIP). – Certificate: IECEx (KEM 10.0003X). – Weight: DC – 3.2kg, AC – 3.4kg. ESS6205X 12VDC +/- 25%, 850mA. ESS6210X 24VDC +/- 25%, 800mA. ESS6215X 48VDC +/- 25%, 420mA. ESS6220X 115VAC +/- 10%, 180mA. ESS6230X 230VAC +/- 10%, 90mA.